For many decades, the Holy See has advocated nuclear disarmament. 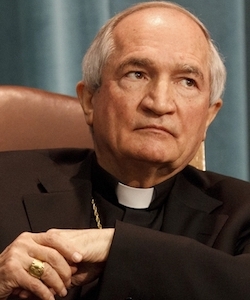 In 2012, the Vatican declared that the strategy of nuclear deterrence is an obstacle to disarmament, and in 2014 at the Humanitarian Consequences Conference in Vienna, Archbishop Silvano Tomasi presented an extended argument for the Holy See’s position. At a time when the prospects for disarmament seem dim, Archbishop Tomasi discussed alternative suggestions to open the way to new progress toward disarmament in keeping with Pope Francis’ call for the prohibition of nuclear weapons. This event was co-sponsored by the Berkley Center for Religion, Peace, and World Affairs and the Office of the President. Silvano Maria Tomasi is a Roman Catholic archbishop and currently serves as the secretary of the Dicastery for Promoting Integral Human Development. Tomasi previously served as permanent observer to the Office of the United Nations and Specialized Agencies in Geneva for over 10 years. Before this, he had been named the archbishop and nuncio to Ethiopia and Eritrea after serving as nuncio to Djibouti. Until his appointment to these posts, Tomasi served as secretary of the Pontifical Council for Pastoral Care of Migrants and Itinerant Peoples. Additionally, he co-founded the Center for Migration Studies. Tomasi obtained his Ph.D. in sociology from Fordham University.